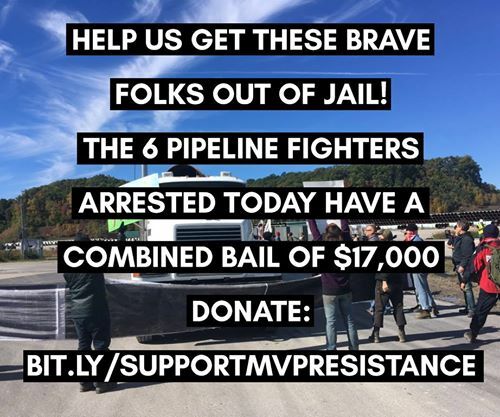 BECKLEY, WV (WSLS) – Six people are facing charges after a protest at a Mountain Valley Pipeline equipment yard. The group is named Appalachians Against Pipelines. Organizers say more than a dozen people blocked trucks from entering and leaving the sit-in in Beckley, West Virginia. The site stores and stages hundreds of sections of the pipe. They say one person locked their body to a truck carrying a section of the pipe. The protestors who were arrested are charged with trespassing and obstructing. 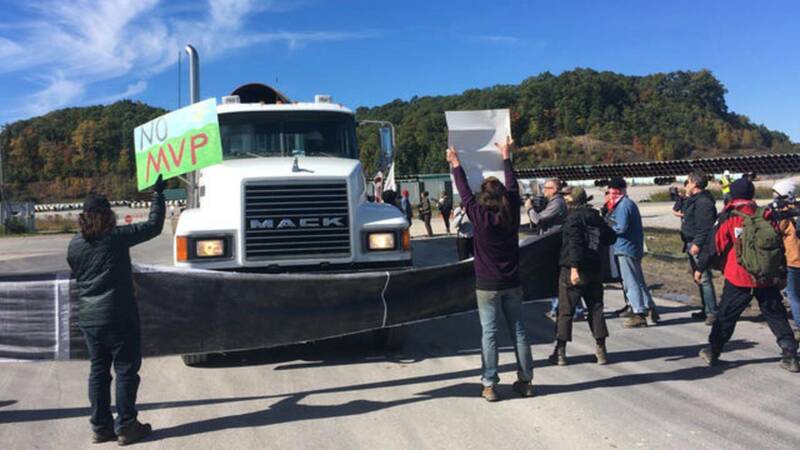 BRADLEY, WV (WVNS) – Protestors gathered in Raleigh County on Monday, Oct. 22, 2018 to share their message against the Mountain Valley Pipeline. The group from Appalachians Against Pipelines included dozens of people. 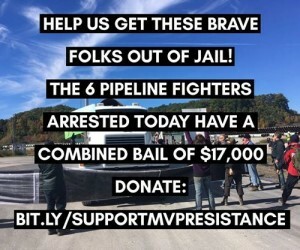 They gathered outside the pipe yard in Bradley off of Route 19 at around 11:45 a.m.
Raleigh County Sheriff’s Deputies made several arrests in connection with the protest. Deputies said they are being charged with obstruction and trespassing. Dozens of vocal and vigilant protesters, who are members of the Appalachian Against Pipelines group, appeared at the Mountain Valley Pipeline’s Bradley pipe yard late Monday morning. A protester, who goes by the name ‘Lauren,’ said she believes any project like the MVP is unsafe for workers, neighboring communities, and the environment. Multiple arrests were made by Raleigh County Sheriff’s deputies, who said they are not taking sides, only keeping the peace among the protesters and those they were picketing. According to the magistrate, Ethan Wilton of Kentucky was arrested and arraigned on charges of trespassing, obstructing an officer, and tampering with an auto. Lauren Malhotra was also arrested. She is charged with just trespassing and obstructing charges. Deputies say there are more arrests. Itasca County, Minnesota – Today four people calling themselves the “Four Necessity Valve Turners” shut down Enbridge’s Line 3 and Line 4 tar sands oil pipelines in Minnesota citing “imminent and irreversible damage being done to the planet.” The activists entered pipeline service locations and advised Enbridge of their intention to stop the flow of oil by shutting down the safety valves. Enbridge eventually manually shut down both the Line 3 and 4 tar sands pipelines. The ‘four necessity valve turners’: Allyson Polman, Brenna Cussen Anglada, Michele Naar Obed, and Daniel Yildirim, documented their action in a live feed filled with prayer, song, and an encounter with law enforcement, with one officer who came on them with his gun drawn. Grunts can be heard on the livestream as activists used bolt cutters to cut the chain around the valve. 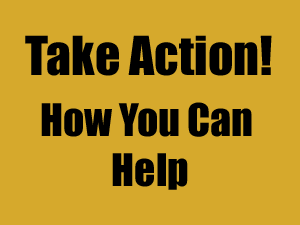 In the video, a speaker can be heard saying that they know what they’re doing is illegal, but that they found it necessary anyway. In the second video the valve turners read the “4 Necessity Valve Turners Statement of Purpose and Intent“: After they read their statement, the valve turners began to pray and sing. The third live video begins with the valve turners stating that Enbridge had shut down the pipeline valve. The Catholic Workers also laced bags of rosaries and prayer ties along the fence and pipeline equipment. The fourth video shows the valve turners reporting that Line 4 had been shut down by Enbridge, while they were also trying to get Enbridge to shut down Line 3 in the same way. The speaker also stated that 68,000 public comments against Line 3 were registered while only 3,000 were in favor of the pipeline. The PUC would vote unanimously to approve the project despite the opposition. In the sixth video, the four valve turners sing a song together as the person streaming shows the prayers ties and crosses tied to the valves and fence. A law enforcement officer arrives and starts interacting with the valve turners, stating that they had a lot of calls and now have to deal with them. The seventh video starts with the streamer saying the phone had been acting weird. They said that in the break between streams, the police threatened them at gunpoint demanding they hand over the bolt cutters. The speaker went on to describe how when the officer tried to climb the fence, they decided to give him the bolt cutters, worried that he would get hurt climbing over the barbed wire. As the valve turners were led out, one of the officers said, “You folks are the first people I’ve had to deal with this pipe business.” One valve turner responded, “If they stop doing what they are doing hopefully you won’t have to deal with anymore.” Before the live video feed went down, a law enforcement officer can be seen returning mittens a valve turner had given him to keep his hands warm. Currently, the four valve turners are in police custody at the Itasca county police department in Grand Rapids in Minnesota. They are set to be arraigned on Wednesday morning. Protest actions against Enbridge oil pipelines continue in Minnesota as the recently elected Governor Tim Waltz debates whether to withdraw an appeal against the Minnesota Public Utilities commission’s certificate of need granted to the tar sands oil pipeline project. Criminal charges against a the first valve turners who took a similar action to shut down pipelines where dismissed by a judge in October 2018.